We rent tables, tents, chairs party equipment in the Atlanta, Georgia area. One stop shop for your party rental needs. Our rental tables are available in different lengths, heights, and styles. 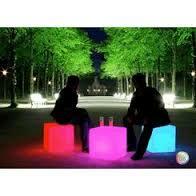 They can be used for seating, buffet, gift, cake, dessert, registration and displays. 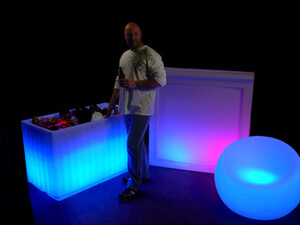 Check out our new line of Lighted and LED furniture. They will make ANY event a huge success. The rental banquet tables are available in 6 and 8 foot lengths by 30" widths. They are good for informal seating such as graduations, barbecues, and back yard parties. Banquet tables are also excellent for buffets and can be combined with serpentine and round tables. 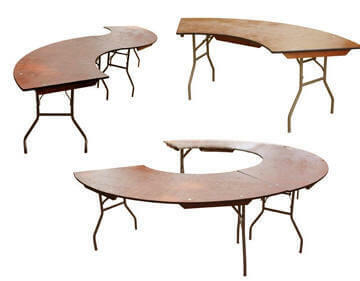 The rental round tables are available in 60" (5') and 48" (4') size diameters. 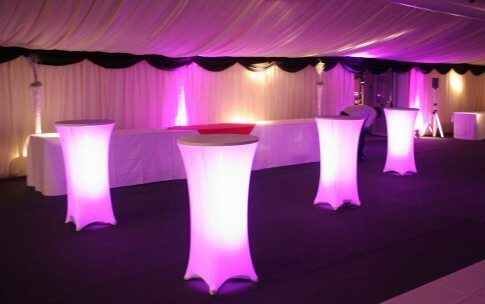 They are best used for formal events such as weddings, sit down dinners, and cake tables. Cabaret rental tables (hi-boy, tall-boy) are perfect to sprinkle around a dance floor, bar, or deck area. 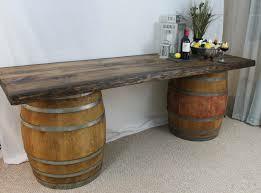 You can rent bar stools with them or use them as standing tables. 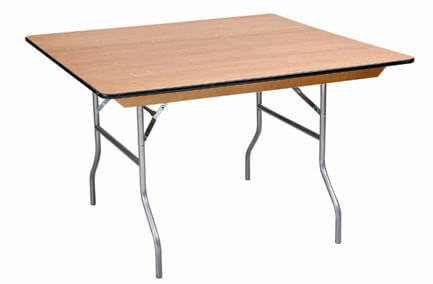 You can also rent the regular table height cabaret tables for small dining tables (2 max. ), serving, display, registration, etc. Rectangle rental tables are great for informal seating or buffets. Round rental tables are good for formal seating and cake tables. Awesome for creating spectacular buffet effects. You can combine several of these to create a dramatic look. We highly recommend that you rent linens or purchase disposable paper/plastic table cloths for the tables (non-LED). The tables are plywood, like all other rental companies, and very strong but they are not designed to be used with out some type of covering.